Dr. Katerina Gallus and Dr. Trent Douglas discuss the two most common neuromodulators – Botox and Dysport. To talk to you about Botox and Dysport. These neuromodulators can be used to reduce the lines of facial expression and restore a more youthful appearance. Botox and Dysport injections are done as in-office procedures. After your injection, you’ll need to stay upright for about four hours and avoid strenuous activities for the rest of the day. The injections take about seven to ten days to have their full effect and will last for three to four months. The most common areas to treat include the 11’s in between the eyebrows, the forehead, and the crow’s feet. Other common areas to treat are the jawline and around the mouth. Any injectable or filler is best performed in conjunction with a skincare routine to maximize your benefits. Botox and Dysport injections are safe, consistent, and reproducible. 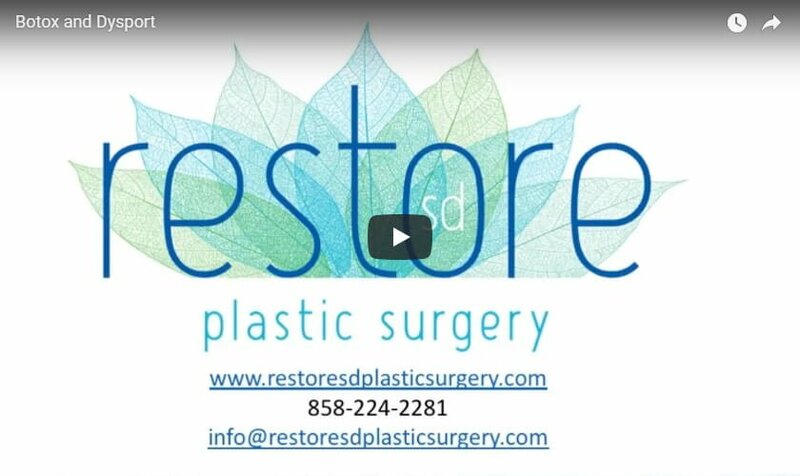 We really enjoy doing them at Restore SD Plastic Surgery. We look forward to seeing you for your Botox or Dysport consult.